As students prepare to take the SAT exam they search for secrets to beating the SAT. Prior to the exam, experts always recommend that students take either a comprehensive SAT Prep Class or an SAT Online Crash Course. 1. Look at your PSAT results and identify topics and skill sets that need more attention and focus primarily on those areas. Identify the areas that you had a hard time with and need more practice on before you take the real SAT test. Preparation is a key element for success on this test. The Official SAT Study Guide, 2nd edition is published by the makers of the SAT and it contains 10 different practice SAT tests. After examining what areas that you struggled with on the PSATs, practice those areas on the tests that are provided. By purchasing this book, students can prepare for the test on their own and learn more about the various sections and the reoccurring types of questions that are present on the SAT. There are many helpful strategies and study skills provided. 2. Focus on the different skills for each section of the test. The most important thing to remember when taking the math section is to SLOW DOWN! “Students should remember its just as much a math exam as a reading exam. This is going to sound counterintuitive to students; but slow down when reading questions. This sounds counterintuitive because most students rip through questions to get to the work, but it is critical to slow down and carefully read through each question and unravel the opaque question,” says Rosensohn. 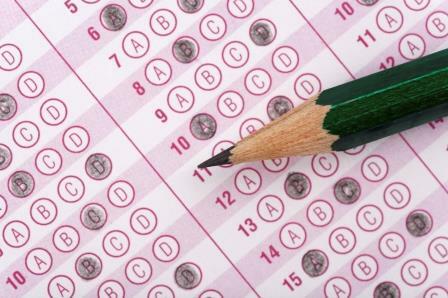 Another helpful hint to remember is unlike in school, the SAT test provides you with the answers. When a students gets to a tricky question and they are not sure where or how to start, Sam Rosensohn encourages students to work backwards and plug in the different answers you are provided with in order to determine which is the correct one. According to Rosensohn, “This test is measuring aptitiude as well as math content, so the questions are tricked up and slippery.” Make sure to slow down and concentrate on each of the questions. Since the grammar section is very repetitive and involves only a small amount of grammar topics, students should not stress too much about this portion. “If everything there was to know about grammar weighed 100 pounds, the grammar on the SAT test would weigh less than a pound,” according to Rosensohn. Students should focus on the grammar concepts that are found in the SAT Official Study Guide tests and familiarize themselves with the types of grammar concepts and questions that are repeatedly being asked. Rosensohn said, “The most common grammar found on the test are questions that deal with misplaced modifiers, ambiguous pronouns, faulty comparisons, subject-verb disagreement, and adjectives that should be adverbs.” Reviewing these concepts that repetitively appear on the test is important for students to do before taking the grammar portion of the SAT. The third step for improving your test scores is by far the most important. Learning the skills of how to take the test and understanding the scoring are crucial. The best advice Sam Rosensohn can give to students is, “DO NOT take the test cold.” Students should have enough practice under their belts so that when they do take the test, they are prepared and ready. Rosensohn pointed out that it is essential for students to know how many questions they need to answer in order to get the score that they want. Knowing the amount you can leave blank on the test is an important strategy that every student should learn before the test. If a student wants a 500 on the critical reading section, which would be equivalent of a 45 out of 100, they need to answer a little more than half of the test. For a 600, which is a 69 out of 100, the student should answer most of the test, leaving about 15 percent of it blank.